Among the greatest struggles in the Christian life are the "little things"—the day-to-day "bad habits" by which we continually fall, and which seem to trap us in our sin. Is there a way out? 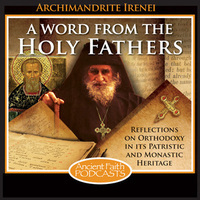 In this week’s episode, Archimandrite Irenei examines the Fathers on sin as habits, how these habits enslave us—and most importantly, how we can overcome our shackles and progress toward the Kingdom. Today, a few brief words from our Fathers among the saints on the subject of habits, specifically bad habits and the slavery that they impose upon us, and by looking at this slavery of habits, of habituation, to see also what the Fathers have to say about how to overcome them. Every Christian person struggles constantly with the fact that, despite the desire, often very sincere, to live a godly life, to live in a holy way, we find ourselves constantly repeating patterns of sin, patterns of impure thought, of action, of behavior, word, and deed. Perhaps the verses from the Scriptures which resonate most of all with so many of us are those of the Apostle, St. Paul: “Lo, I do not do what I wish to do, and the very thing I wish not to do, this is what I do.” How many of us have felt that these are our words, when we find again and again our same habits of negative behavior emerging despite our repentance, or what we thought was our repentance, despite our desire and our will. We find ourselves, as it were, shackled by these patterns of behavior. And if we have felt frustrated in this, and all of us, when and if we are honest with ourselves, admit that we are frustrated with this, it is perhaps a great comfort to note that our Fathers, the saints of the Church, identified this long ago as part of the ongoing daily struggle of Christian life. In the fourth and fifth century, one of our great Fathers whom we quote and discuss and hear so often. St. John the Golden-mouthed, St. John Chrysostom, said, “There is no tyranny so unbearable as a habit. It is with reason that it is to be called a second nature.” Our habits, says St. John, are tyrants, and they are the most terrible of all. I wonder myself if this is often because we do not identify them as being tyrants, as exercising what St. John calls this great tyranny. It is easier to combat a thing when we recognize that it is our foe, but so often we don’t see our little habits here and there as enemies, as obstacles, as things which exercise tyranny over us. So they become part of us, part of our daily life. As St. John says, it’s not without reason that they can be called almost our second nature. Our habits, whatever they may be, whether it is short-temperedness, arrogance, responding too quickly when someone wrongs us, overtalkativeness, inquisitiveness, whatever it is, these become so in-built into our day-to-day behaviors that they become like a second nature, and the real tyranny of our habits is that this second nature becomes so strong, so dominant, that we often think of it as our first. But the Fathers always remind us that our true nature, as creatures fashioned by God after his own image and in his likeness, our true nature is one of holiness. And when we find ourselves slipping into contemporary phrases, like, “Oh, to err is human,” or “This is simply what I do. It’s human nature, after all,” let us always be reminded by the Fathers that it is not human nature to sin. Our sinfulness and our sinful acts may be so habituated into our lives that the second nature, as St. John calls it, seems to us more real than the first. But as Christians we live ever in the knowledge and the great hope that this is habit, this is tyranny—but habit and tyranny can be overcome. St. Ignatius Brianchaninov, a great 19th century saint, once said, “Immoral habits are like shackles. They deprive man of his moral freedom and forcibly keep him in the stinking swamp of the passions.” That second nature, as St. John called it, that great tyrant of our habits is, for St. Ignatius, the shackles that bind us in a murky swamp. Like any shackles, they restrict our freedom. Human nature is free. Human persons are created in freedom, even as God is free. Yet we sometimes forget, when we discuss the effects of sin on human life, that freedom, free will, is itself something which sin disfigures. Very often when we discuss sin and fall, we seem to speak of human freedom as if it remained inviolate and unscarred by sin, but the Fathers of the Church tell us clearly that even our moral freedom is shackled down by our sin, and more specifically by our habitudes of sin. When I constantly act in a certain immoral way, St. Ignatius says, that action, that habit, shackles me so that when I am faced with a choice, do I behave thus or differently? I am bound in to my habits. I naturally, it seems, act in a sinful manner. This is the great, the fearful, the terrifying reality of what sin does when it becomes enshrined in our day-to-day habits. This is the reason for many of the Fathers that the “big sins,” as we often think of them, are often less dangerous in the spiritual life than the little ones. Those great acts of obvious, remarkable sin are easily identifiable, and though it may take us some time and some coaxing, we are generally eager and willing to repent of such things, to set them aside and to say, “No more. Never again.” But we are all to ready to overlook the little things, the little immoral acts, the small sins, as we so like to characterize them: the little fact that I happen to be short with people, the fact that I tell a little fib here or there, that I do harbor angry thoughts—but they’re just little things, and I never act on them aloud. These are the sorts of excuses that we make for ourselves, day to day, all the time. But it is important that we say that we find ourselves almost unable to act, for we are not, in truth, unable. Our second nature may be the one that rules us, day to day, but it is not our true nature. So how do we overcome these habits which become so fundamental to our day-to-day lives? St. Isaac of Syria has this to say: “It is impossible to surmount the great if one does not conquer the insignificant.” When we approach our ascetical life, the correction of those things which keep us from a life of holiness, very often we are tempted to turn immediately toward the great things: our great deficiencies, our great intentions. But St. Isaac makes very clear: we cannot surmount these great, these significant, if we do not first surmount the little, the seemingly insignificant. In our day-to-day life, it is the little habits which bind us, which enslave us, far more than the great. The great may be those that plunge us down into the depths of the sea, but we are prone to them. We are able to be influenced by them because our little day-to-day habits have already chained us into a position of slavery. So we must act on the little things, those small gestures of sin which permeate our day-to-day life. This is where the ascetical struggle must begin. Abba Isaiah of Scetis takes the same message that we just heard in St. Isaac of Syria, but he gives it from a different perspective. Rather than saying what cannot be done, he tells us what can. Abba Isaiah says: “He who conquers himself in the little things will also do so in the great ones.” If we are attentive to the little things, the habits of sin which seem insignificant but which in fact are the very chains of our slavery, we will conquer the great. We mustn’t feel that we are ignoring the larger issues of our spiritual life by focusing on what seems small, insignificant details, for it is in conquering the little things that the great become prone to fall. It is in making small steps of progress that we travel down the road into the kingdom. If we try to leap down this road by huge jumps and bounds, we find very quickly that we fall, and we fall hard, and our progress is thwarted; but if we take small steps, addressing the habits which enslave us, which tyrannize us, if we can liberate ourselves by God’s grace and by the ascetic practices of the Church from these things, then our steps become sure and solid, and lead us into the kingdom. May it be that in our day-to-day life, when we encounter ourselves in these situations, we remember the words of the Fathers, who see so clearly what our real spiritual condition is, and who give us, as great pastors and guides, the keys to moving forward in true repentance to a real redemption. Through the prayers of St. John, St. Ignatius, St. Isaac, and Abba Isaiah, and of all the saints, Lord Jesus Christ our God, have mercy on us and save us. Amen.